If you know me then you will know I am a bit of a bag hoarder, I don’t know what it is but ever since I was younger I have always had a love for bags and just can’t stop buying them. I remember my dad once asked when I was around 10 why I needed a ‘grown up’ handbag when really I did’t what did I possibly have to put in there. My best friend Kirti has even made me leave this bag in my uni room so I don’t use it before going back to university and buy another. 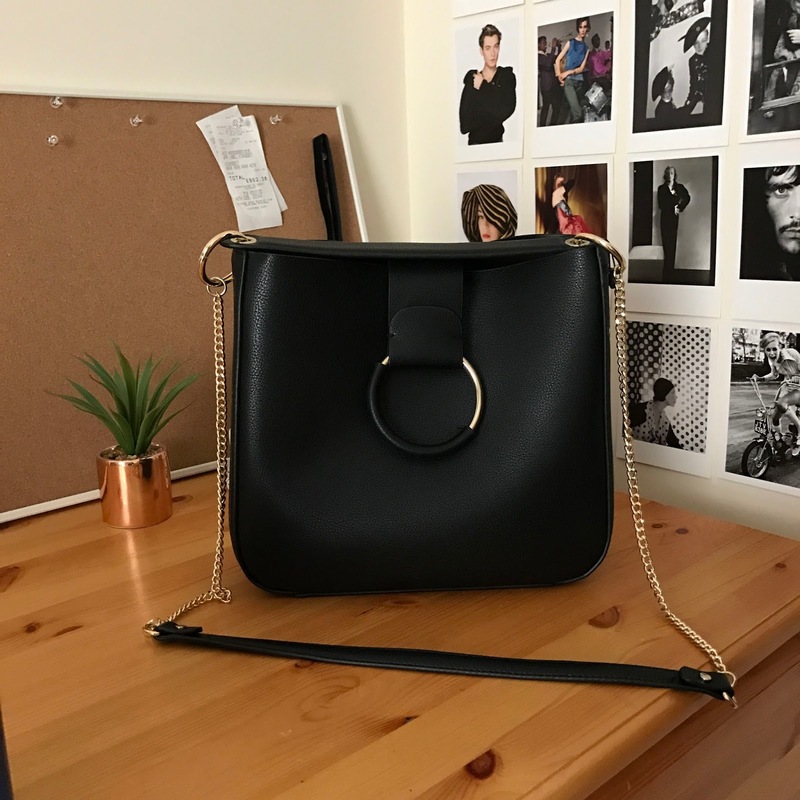 So the bag I have fell in love with this month is from Zara its a medium bucket bag with three hoops taking inspiration from the ever so dreamy Chloe bags which I hope to own one day. You might have actually seen it on my Instagram, if not then you should follow me here. Bucket bags are very much having a thing this season with them being all over the high street and designer stores. Unfortunately I am not yet at the designer price point so when I saw this on the Zara website I knew I just had to have it and for £19.99 you can’t really say no. 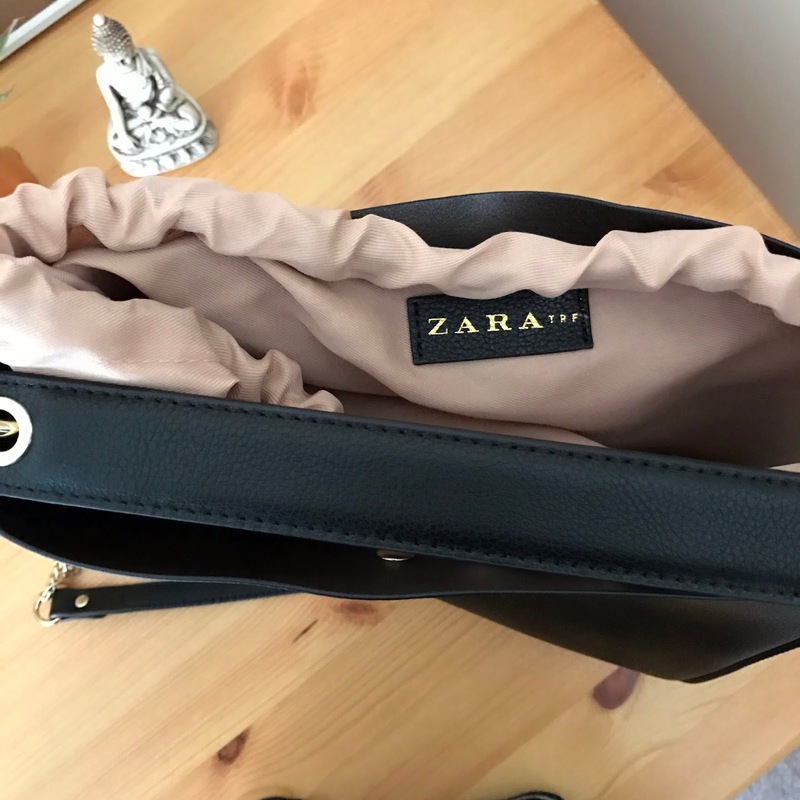 Zara for bags are amazing I have their mini city bag and that has lasted me a good few years now. I wanted to upgrade my uni bag for something a bit more stylish and on trend but still could fit a reasonable amount of stuff in it. 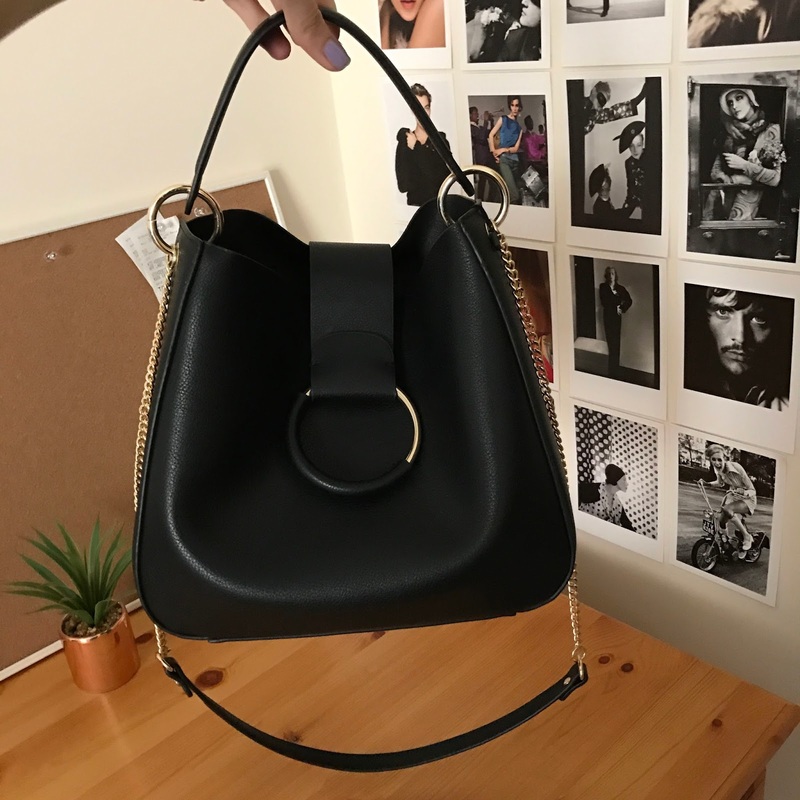 As you can see the bag is a black leather, they also do it in red but black is a lot more practical for me, it has lovely gold detailing with the hoops and gold chain. What I love about this bag is that the chain also has a leather shoulder strap as I hate when chains are digging into my shoulders. It also has a short leather strap if you want to wear it on your wrist or just hold it. Inside the bag it has just the one compartment which is a blush pink drawstring (I actually at first thought it was dustbag) as it is a bucket bag it’s pretty easy for someone to pop their hand in but with the drawstring it means you can keep everything safe. I would say I can fit my Ipad, small notebook, phone and water bottle all comfortably in for a day at uni. I have done a lot of what’s in my bags so if you would like to see one for this bag let me know! I hope you love the bag as much as I do, Zara are very famous for taking inspiration off of the catwalk but I am glad this is not a direct copy of a Chloe bag but their own take. WHY A CAPSULE WARDROBE COULD BE RIGHT FOR YOU?